Suarez: leaving Barcelona for Italy switch? Despite high hopes for Suarez by manager Unai Emery, the player has been given little opportunity as the outbound Aaron Ramsey has been preferred in the middle of the park for Arsenal. 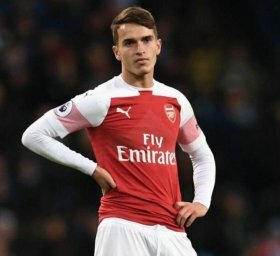 Suarez, although very talented, appears to have not caught the eye in training at Arsenal since his move in January and now could be headed for Napoli. Suarez's agent Felix Gende told reporters: "He has two years left at Barcelona. This year in England hasn't been his best. "He has played little and hasn't been able to find a rhythm. At the moment, he's injured. He has muscle fatigue and an injury.